Who doesn’t love to try out new fishing gear? I know I for one love to try out new equipment, be it a new lure, reel, line or rod. It’s not just about buying your new product, giving it a cast and saying “ok, it’s all good”, I like to test new gear to the max and really see what it can do. After all, it’s no use having a piece of gear let you down when you think it can do something it can’t. 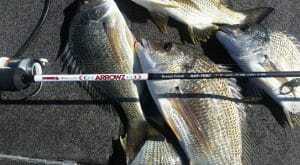 The product I am testing at the moment is the new Atomic Arrowz rod. I will run through how I test out any rod or lure I use, but first let me tell you a bit about this rod. One thing I like about Frogley’s is that they listen to the anglers and know that although most anglers who fish comps are happy to pay top dollar for their rods, for the average fisho who only gets out on the water every now and then, they won’t pay a big price for something they are not going to use a lot. So Frogley’s came out with the Atomic range of rods, a top-quality range without the big price tag. I have been using this rod for some months now after getting it for running hard body lures on fluorocarbon line, like the Atomic 38 crank, and I have to admit it is one of the best rods I have used for this type of fishing. But is that the only thing you can use it for? Some people may be happy with that but I remember a time when a rod I got for throwing hard body lures just wasn’t right for the job. 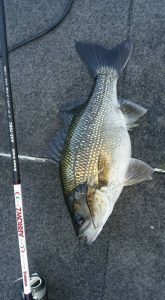 So I ran it through every type of lure until it ended up being one of my favourite surface fishing rods! I find with fishing there are no rules and I like to test out everything to the max. So, the first thing I do is use the rod for what it is designed for, or what I brought it for, in this case to run straight through fluro with hard bodies. Then I like to see what else things can do. This time the 2nd thing I did was to put on a jig head and throw on an Atomic fat grub to see how it goes. I then swapped reels and ran some braid, trying that out with some plastics and a hard body. I also tried using it with a vibe and a surface lure. I know it’s designed for Bream but try it on some Flathead or Bass to really test it out. In this case the Atomic Arrowz was perfect for what it was designed for and now has 3Lb Unitika silver thread and a 38 Atomic crank attached to it. The same can be said for a lure. Once upon a time my favourite Trout lure was also my favorite Bream lure, and the new Hardz suspending 65mm jerk minnow is an awesome lure for the black Bream and Trout, but as I have found the Bass smash them like it was there last meal. 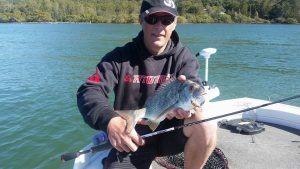 On a day when the Bass were just following the lures I was using and I could not get a hit, that’s the time I had to start thinking outside the box, and in this case had me looking through the Bream tackle box and coming up with the Atomic 65mm jerk minnow. From the first cast and the first pause, the Bass were smashing them when nothing else could get a touch, and I went from a no fish day to one of the best Bass bites I have had in a long time! So the next time you buy a new lure, reel or rod, experiment a bit and test it out. Just because it’s made for one thing doesn’t mean it can’t do more than it was made for! Try throwing a different lure with that rod, try throwing that Bream lure for Bass or Jew. You never know and may just find out what your fishing tackle can really do!